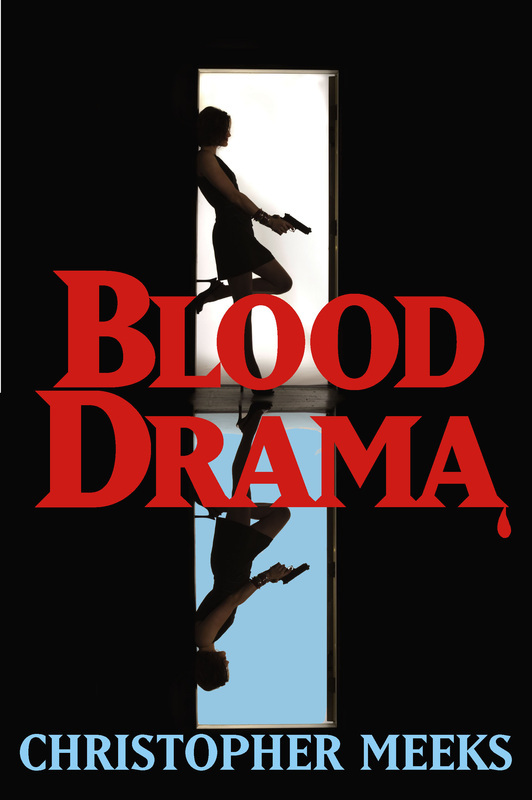 I recently caught up with Meeks to chat about his new novel, Blood Drama. Tell us a little bit about the novel. Blood Drama is the story of Ian Nash. He has lost his girlfriend, just been thrown out of a graduate program in theatre, and is taken hostage in a bank robbery gone awry. He must fight for his life. He’s determined to exact revenge, with or without the FBI’s help. You’ve published two excellent short story collections–Months and Seasons and The Middle-Aged Man and the Sea–a literary novel titled The Brightest Moon of the Century, and a cerebral romantic comedy titled Love at Absolute Zero. Now you’re experimenting with the thriller genre. What accounts for this latest move? Most of my short stories and the first two novels were connected to events that have happened to me. I had no more major events to draw on, so at first I was stumped. What now? In the meantime, I’d been correcting my students’ papers in a Starbucks in the lobby of a bank. It was a gorgeous setting with a lot of marble, a fireplace, and comfortable chairs. I was there often, until one day I realized I could be a witness to a bank robbery if I didn’t watch out. I pictured being taken hostage after a lot of gunfire—and that was the start of a story idea. Over the years, if ever I wanted something fun to read, I’d choose a crime story, such as novels by Michael Connelly, Robert Crais, or Raymond Chandler. I asked myself, why not write in a genre? Once I learned that bank robberies are a federal crime that involve the FBI, I wanted someone nearly the opposite of Ian, an extremely driven woman, Aleece Medina. She’s making her mark as a special agent focused on bank robbery. Where Ian was taking his time finding his niche in theatre, she was focused on her goals. However, once Ian is kidnapped, his life changes so dramatically, he too is driven, and he and Medina often lock horns. Because I was new to this world, I did a lot of research, including interviewing two FBI special agents. I wanted the details right. And along those lines, what do all of your works have in common, regardless of genre? What matters to you as a storyteller? What matters to me the most is having interesting characters. Plot is simply what interesting characters do. I don’t consciously think “quirky,” even though reviewers commonly cite this as a good quality in my work. That tells me my characters are memorable. I also never consciously question how my stories might connect to each other—that they might share common qualities. However, reviewers who really examine my books deeply, as you do, find things. I love when reviewers see intersecting themes or quote some of their favorite lines. This shows me that my struggle and obsession over meaning and making the right image, the right simile, is worth it. I reviewed books and theatre for nearly a decade for newspapers, so I know that writing informative and interesting reviews takes work. The most difficult reviews were often the really great books and plays because I needed to explain WHY, and sometimes it’s hard to understand why something works because the great works also have a mysterious quality that can’t necessarily be explained. I grew a lot in understanding stories and story structure by having to write reviews under deadline. Stories that had been rejected more than forty times, I stopped sending out, figuring they needed more work. One day I read that the Santa Barbara Review was looking for literary stories with humor. “We just don’t get a lot of stories with humor,” an editor wrote. I sent her “Divining,” one of my favorites, and three days later I received a call from her. She wanted to publish it and did. After it was published, I photocopied it and included it with my next submissions to prove I was established. That improved my acceptance rate a lot—to about one acceptance to every nine rejections. That’s the thing with writing—you’re rejected more often than not. Ironically, some of the places that turned my new stories down said, “If ‘Divining’ hadn’t already been published, we’d take that.” No they wouldn’t—because they had rejected it the first time. As you were working on Blood Drama, who were some of the authors who influenced you? To put it another way, are there authors whose fans will especially enjoy Blood Drama? Authors who write crime novels that also have humor include Carl Hiaasen, Donald Westlake, and Robert Crais, but we’re each unique. My voice is different than any of theirs. The authors who have most influenced me include Tim O’Brien, who I admire for his details and his idea that fiction is truer than nonfiction. Kurt Vonnegut has always been a touchstone. Beneath his humor are always serious points. He’s more of a sociologist than I am. I’m more intrigued by the psychology of individuals. I’m a huge fan of Margaret Atwood, too. She’s like Vonnegut, completely fascinated by societies. I’m eagerly awaiting Atwood’s MaddAdam, the third in a series. In short fiction, I’m forever fascinated with the works of Lorrie Moore, Ernest Hemingway, Raymond Carver, and J.D. Salinger. From the outside, writing appears to be a solitary endeavor, but a lot of writers rely on a team to help them get through the long and frequently arduous process of seeing a novel to publication. Who was on your team, and what did your process look like? The first team members are the people you trust to read your first polished draft. My stories and novels seem to find their backbone and polish around draft five, and so I use the people who read the early drafts to discover where I may have jumped over something or not made something clear. That includes my sister, Laura, my father-in-law, David, some writer friends, and my wife, Ann, a voracious reader and librarian. Writing is indeed NOT solitary because as writers, we have to find the gaps between intention and what is understood by readers. The reverse is true, too—what’s overstressed or abundantly clear early on that doesn’t need redundancy? I need other sets of eyes to help me see what’s missing, confusing, or is too much. I used to work with agents—and I loved them—but despite my last one finding enthusiastic editors, the publishing companies’ marketing departments would balk at my novels. “How will we market a story of a quantum physicist falling in love? People are intimidated by science,” was the challenge with Love at Absolute Zero. I’ve never written out of a formula. I’ve written to explore the human condition. I followed my own odd interests. What I do makes me feel part of a community. It’s not a solitary endeavor at all. What do you do when you’re not writing? How do you make a living? Does it relate to your writing? How do you fit writing and all that goes along with it into the bigger picture of your life? One day three years out of college, selling tile at Color Tile, I realized that even though I was writing, I wasn’t immersed in the arts the way I had hoped. I needed to surround myself with writing. Thus I went to an MFA writing program at USC. 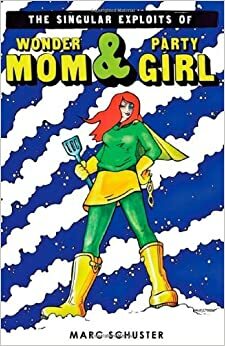 While this put me solidly in the world of books, the only writing I did was ghost writing for Peter McWilliams. He had a weekly national computer column that I wrote. I became a computing expert, but I wanted to write plays, which I then squeezed in somehow. I quit Prelude Press after four years to be the institute writer at CalArts. There, I wrote about all the arts and interviewed some of the top people in the fields of dance, theatre, fine art, film, music, and writing, including Tim Burton, Werner Herzog, Alexander Mackendrick, Don Cheadle, Mel Powell, Morton Subotnick, Charlie Haden, Carolyn Forche, and more. I also interviewed many fascinating but lesser-known people. I learned from all that the best artists were thinkers, driven to explore. I also learned vividly that most artists are unsung. That is, most artists of any sort are not known to people because Americans tend to equate success with money. Outside of movies, there are not a lot of rich artists—few wealthy playwrights, dancers, videographers, musicians, landscape painters, actors, stop-motion animators, etc. Still, artists look at things that most people zoom past in their walks and drives. Most people are terrible at relationships, for instance, but don’t think about it except in seeing a movie or play or talking with a shrink. Most people get stuck in life’s tar pits of one sort or another, be it failed marriages, horrible debt, drug problems, dead-end jobs, stress, poor health, bad self-esteem, and many other things. It’s amazing many people make it to sixty. These are the things I like to write about, and at CalArts and now at Art Center College of Design where I teach, I see a hell of a lot of drive. These are people who pursue interests that may not bring in a lot of money but, for instance, there’s something about writing a great passage with an amazing simile that most people just can’t do. The arts offer purpose and meaning. Right now, I have a great balance in my life. As someone who used to be deathly afraid of public speaking, I overcame that to teach writing. To write is to think. I’m fueled by my students, who are interesting. I also teach English at Santa Monica College, where, in Introduction to Literature class, I get to teach great writing all the time, and I continually search for ways to show how poetry, drama, and fiction are as necessary as oxygen. And know what? I may not be rich, but my wife and I have great kids, friends and family, and we managed to buy our dream home. I can validate Joseph Campbell’s dictum: Follow your bliss, and you’ll also find a good living. I’m writing a mystery, tentatively titled Ten Days to a Bad Habit. I heard on the radio that it only takes ten days to form a good habit. I laughed thinking it’d probably take as long to form a bad habit, too. I started with the notion of a married man at a convention in Las Vegas who is attracted to a woman despite his better instincts, and then finding her dead in his hotel room, where he’s blamed. He has to find out who framed him and why before the police grab him. I also needed to put it in the context of ten days and forming a habit. I’m on draft five. 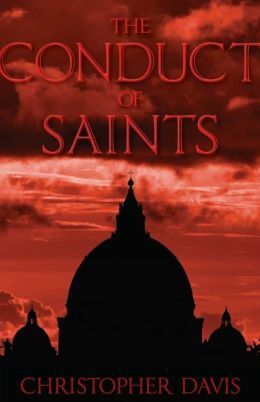 Set in Rome in the wake of the Second World War, The Conduct of Saints reveals Christopher Davis as a writer who remains at the height of his powers at the age of 85. 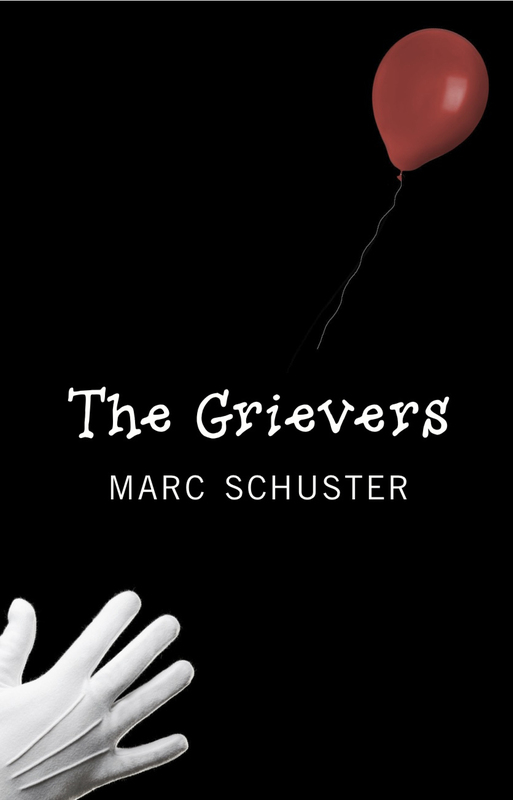 The novel follows a Vatican lawyer named Brendan Doherty (who wins points in my book being a native of South Philadelphia) as he plays devil’s advocate against the man who murdered Maria Goretti yet now claims to have been saved through the soon-to-be-canonized saint’s intercession. At the same time, Doherty is also attempting to prevent the execution of Nazi war criminal Pietro Koch — not out of any sympathy for Koch or his worldview, but out of a firm belief in the sanctity of all life. The result is a complex novel that explores the intimate relationship between faith and doubt while simultaneously delivering a moving and thoroughly engaging story. Throughout the novel, Davis’s gift for setting is especially apparent. The streets of Rome come alive on every page. Indeed, one doesn’t so much read this book as enter its perfectly imagined world of bicycles rattling over cobblestone streets, urchins begging for money, and olive trees providing the only respite from the hot summer sun. What’s more, the time period provides the ideal backdrop for a rigorous interrogation of faith and justice, as the atrocities of the Nazis are enough to raise doubts in even the most pious among us. Yet we are all fallen in some way or another, The Conduct of Saints insists on every page. And the world is highly adept at shaking our faith–however we define it and whatever we believe. Ultimately, however, it’s our power to forgive that renders us so deeply human, and this is the ultimate, uplifting message of Davis’s fine novel. Highly recommended for fans of historical fiction and spectacular writing.